With great sadness we share with you that Sue Frazier passed away on Saturday, Oct. 23, 2010, from complications after routine surgery. Sue was the Institute for Systems Research’s Director of Human Resources and Education. She served the University of Maryland for more than 35 years and was ISR’s first staff member when it started in 1985. Sue was regarded by her colleagues and friends as a role model for professionalism and passion for excellence in higher education, and was the face of ISR to students, faculty and staff alike. 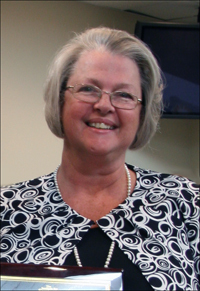 Sue received the President’s Distinguished Service Award in 1997 for exceptional performance, leadership, and service. She also twice received ISR’s Outstanding Staff Award, in 1989 and 2009. Sue’s impact reaches beyond the University of Maryland campus to alumni, collaborators and former colleagues. Many of us have been affected by the immense shock and suddenness of this loss and will grieve together in the coming days. Please keep Sue’s family in your thoughts during this difficult time. • Online via credit card at this link. • By check, payable to “University of Maryland College Park Foundation.” Make a notation on the memo line that the donation is for the Susan Frazier Memorial Graduate Education Award. Checks should be given or mailed to Jason Strahan, 2167 A.V. Williams Building, University of Maryland, College Park, MD 20742.